To set the record straight, Common Core is not about "core knowledge" but rather is the foundation for left-wing student indoctrination to create activists for the social justice agenda. Education is being nationalized, just like our healthcare, to eliminate local control over education, imposing a one-size-fits-all, top-down curriculum that will also affect private schools and homeschoolers. Being in the business of contributing to educational technologies for decades, Microsoft chairman Bill Gates has a much vested interest in education. Great concern has been expressed over the years regarding the driving force behind Gates and his organizations, which have demonstrated unflagging support of many leftist causes. Lamenting that Obama's powers are too limited, Gates stated at a Politico event that, "Some days, I wish we had a system like the U.K. where, you know, the party in power could do a lot and you know, you'd see how it went and then fine, you could un-elect them." The Bill and Melinda Gates Foundation cast a long shadow across America. It is dangerously influencing American education as it funnels money to a vast number of entities. In education media, the foundation supports Editorial Projects in Education, the parent company of "Education Week" magazine. Grants have been awarded to the National Governors Association Center for Best Practices, National Association of States Boards of Education, National Association of Education Publishers, and a number of similar organizations. The foundation has also funded associations of unelected high officials such as the Council of Chief State Schools Officers. Other donations of interest include these: $498,055 to Clemson University for work with members of Measuring Effective Teachers (MET) team to determine feasibility of using Galvanic Skin Response bracelets with teachers and students, $15 million to Harvard for education policy research, and $1 million to national PTA. The intrusion of billionaires into education is not new. In the 1920s Pierre S. du Pont gave more than $6 million to train teachers and to build 120 public schools in Delaware. The Rockefeller family funded child development research which helped to lay the foundation for the Head Start program. In 1993 publisher Walter Annenberg gave $500 million which was matched by $600 million in gifts from other sources. The story of Bill Gates' first foray into education has been well circulated. But for those who are unfamiliar with the outcome, let me briefly summarize it. Using limited data, Bill Gates was convinced that the way to improve education was to have smaller schools. Moving ahead like a steam locomotive, from 2000-2008 the Gates Foundation funded the breakup of large public high schools with low test scores and graduation rates into smaller units totalling nearly 2700 schools. Bill Gates admitted publicly that the initiative results were less than stellar. However, he neglected to mention that his meddling had created much havoc including the disruption of schools, a mass exodus of teachers and students, and plummeting attendance, test scores, and graduation rates. Not to be discouraged, Gates announced they would move on with a new plan: performance-based teacher pay, data collection, national standards and tests, and school turnaround. Indeed the Gates Foundation had already begun funding the creation of The Turnaround Challenge, touted as the authoritative guide on school turnarounds. This strategy was funded by Gates for the Chicago Renaissance 2010 with Arne Duncan as CEO of public schools. It was this program that propelled Duncan into the national limelight and the position of Secretary of the U.S. Department of Education. He took with him the Gates turnaround reform strategy. By January 2010 studies began to circulate about the dismal results of the Ren10, causing a stir about the selection of Arne Duncan as USDOE chief. For the new initiative, Gates decided that teachers should be evaluated on student test score gains. Like his philanthropist friends, Eli Broad and the Waltons, Bill Gates believes that education should be run like a business. Eli Broad explained that, "We don't know anything about how to teach or reading curriculum or any of that. But what we do know about is management and governance." It seems obvious from the ongoing negative results of their "unique ideas" that they know nothing about education from any perspective, not even management or governance. 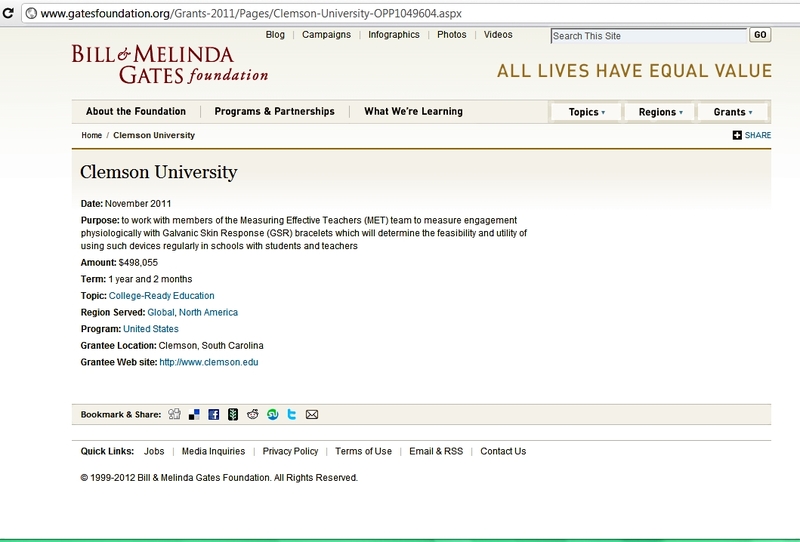 Apparently Gates had no inkling about how teachers would react to the plan to tie teacher performance to test scores. When the storm of teacher wrath erupted, Gates decided that rather than focusing solely on test scores, it might be wiser to spend $5 billion to place cameras in every classroom in America so that multiple reviewers could observe classroom activity. Student evaluation of teacher performance was to be used also. Foiled again.... seems that classroom cameras aren't popular with teachers either. Wait! Don't forget about those Galvanic Skin Response bracelets to measure teacher performance. Will there be student tattoos or microchips next? Gates and other left-wing starry eyed dreamers believe that their money and their unique ideas will solve what ails American education. However, lack of money is not the problem. Some of our worst school systems (e.g. Washington, D.C.'s) spend the most money per pupil. It's obvious that billions of dollars have not solved the problem of social dysfunctions that are the heart of America's education downfall. Neither will tying teacher performance to test scores nor using Galvanic Skin Response bracelets. Perhaps these genius billionaires should analyze why American education has been so successful in the past. But then their social justice agenda would have to be dismantled -- to use a favorite term of the White House gang. With all those billions being plowed into education, we have to wonder if there is something other than left wing philanthropy that has the attention of the Gates Foundation. A bit of research reveals just how profitable Common Core will be for Bill Gates and friends. One component of Common Core is assessments or tests. The profits here are staggering. According to surveys by the Pew Center on the States and the Brookings Institution, state spending on standardized testing rose from $552 million in 2001 to $1.7 billion in 2012. This huge increase in testing was due to the emphasis on standardized testing by No Child Left Behind. This has been a major source of frustration and sometimes anger among parents and students. It's going to get worse, according to Dr. Stephen Krashen, professor emeritus at the University of Southern California. He has calculated that there will be a 20-fold increase in testing for Common Core. The Gates Foundation has partnered with Pearson, the giant textbook publisher, to create online curriculum for Common Core which will drive the volume of testing. Pearson is the exclusive testing contractor for the State of Texas. According to Pearson's year-end review for 2011-2012, more than 11.5 million tests were administered to Texas public education students in grades 3 through 12 for the State of Texas Academic Readiness, or STARR. The cost was more than $89 million! By 2015 the cost for standardized testing is expected to cost Texans nearly $100 million. Based on figures provided by Texas Education Agency, Pearson's five-year contract with Texas from 2010-2015 will total more than $468 million. Even more staggering is the grand total from 2000 -2015 that Texas taxpayers will have paid Pearson -- nearly $1.2 billion for developing standardized tests and related materials. Data mining is another component of Common Core that will reap huge profits for Gates. In a public-private collaborative, the foundation and others gave $100 million to inBloom for a public school database. The purpose is to collect and analyze data which will be shared with private companies that sell educational products and services. These lucky insiders get to mine the information and create new tailored products to sell. Bill Gates has attempted in an unprecedented manner to set public policy, although he is accountable to no one. Few will speak the truth about his failed programs or intrusion on a global scale into the government and the lives of so many. In an imperious overreach, he has funded and marketed Common Core to Americans and circumvented voters on educational issues. The 10th Amendment leaves education to state and local control. Allowing private foundations to set our public policy and to control American education is dangerous to our Republic and our liberties and must be stopped. Carole Hornsby Haynes, Ph.D. is a curriculum specialist and writer, speaker, and commentator for education and cultural issues.